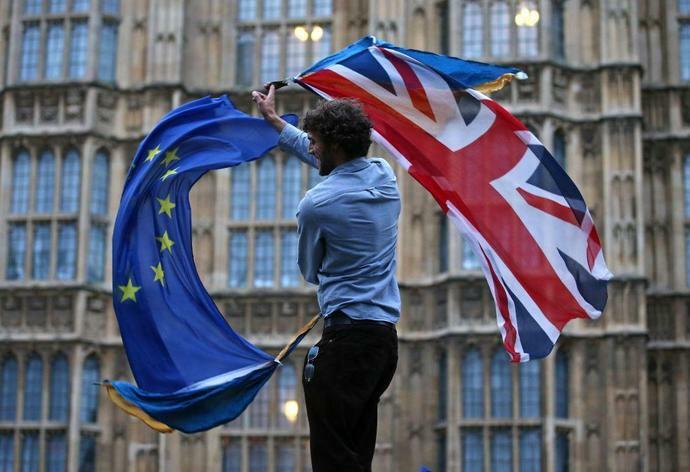 On Tuesday night, U.K. lawmakers resoundingly rejected the Brexit agreement Prime Minister Theresa May has spent a year and a half negotiating with the European Union. It was the biggest parliamentary defeat for a government proposal in the U.K.'s modern history, with 432 lawmakers voting against the deal, and only 202 in favor. As May faces a no confidence vote Wednesday and the British government scrambles to find a way to avoid crashing out of the bloc without a deal on March 29 (a "no-deal" Brexit), the rest of Europe is watching the chaos unfold. Here's what their front pages and editorials looked like. In the Republic of Ireland, whose second-biggest trading partner is the U.K., the mood is understandably tense. Conservative daily the Irish Examiner dubbed the rejection of the deal "carnage" and warned that it leaves the U.K. on the "Eve of Destruction." Dublin, it says, is now planning for "worst case scenarios". The editorial board of centrist newspaper The Irish Times writes that the scale of May's defeat means her only option is to hold a second public referendum on E.U. membership. "The other E.U. members would surely agree to extend the UK's departure date under Article 50 to allow this to happen," the paper claims. With dramatic flourish, the editorial board of centre-left daily Le Monde compares the U.K.'s current political trajectory to the country's most iconic car: "Like a Rolls-Royce whose brakes have been cut and is sliding unstoppably down a slope into an abyss, Great Britain sinks deeper into the Brexit crisis." While none of the E.U. 's other 27 members wants to "close the door in Britain's face," the editorial continues, "Enough is enough. The time has come for them to make up their minds." Guillaume Maujean, a columnist for French financial newspaper Les Échos, appeals to Britain's most famous historical statesman, "Churchill, wake up! They've gone crazy!" He lays the blame for the confusion firmly on the British political elite, who, he says, "could now push the whole of the U.K. into a no-deal Brexit no one wants". Italy's leftist newspaper La Repubblica echoes the widespread sense of uncertainty with its front page headline "May on the edge of the abyss." A column by the paper's Enrico Franceschini labels Britain "an island adrift" and expresses frustration that, two and a half years after the U.K. voted to leave the E.U., the whole process "seems to have gone back to square one." Spanish daily ABC's front page claims the British have been left "Prisoners of Brexit." Its story warns that, with the deal voted down, "no one has any idea when this process will end, nor how to go about it." The editorial board at German conservative broadsheet Die Welt has harsh words for May. "May deserves this defeat in Parliament because she herself is to blame […] From the outset, as head of government, she only had her Conservative [party] in view." The paper argues that May should resign. "For British politics, May's persistence, which has long bordered on stubbornness, is a disaster." WASHINGTON (AP) - The Trump administration is set to announce Wednesday that it's allowing lawsuits against foreign companies operating in properties seized from Americans in Cuba, a major policy shift that has angered European and other allies. Sweden's teenage activist Greta Thunberg on Tuesday urged Europeans to vote in next month's elections on behalf of young people like her who cannot yet cast ballots but demand decisive action against climate change. During a visit to the European Parliament in the French city of Strasbourg, Thunberg, 16, told a press conference that time is running out to stop the ravages of global warming. "I think it is essential to vote in the European Union election," Thunberg said when asked about the May 23-26 elections for a new European Parliament.